that was oh so fun to make! A year+ after purchasing the entire Christi Friesen line of Swellegant products, I finally got around to playing with it. What an unbelievably cool surface treatment this stuff is! 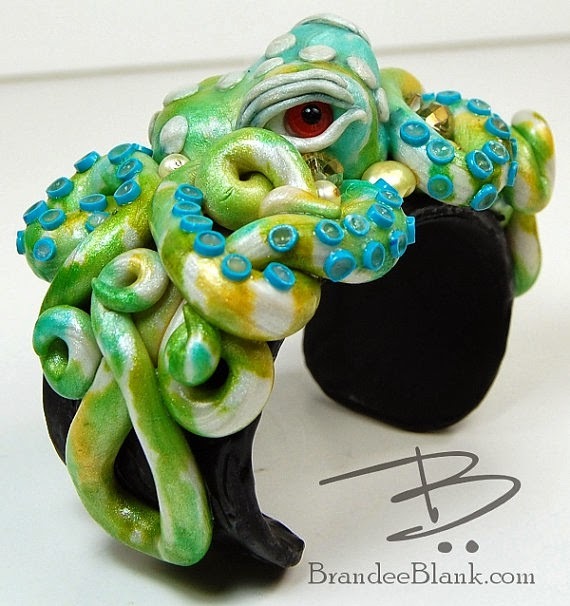 There are plenty of how-to's and tutorials out there already for folks to look at, namely the one that CF Originals has available on her site, and a terrific guide put out by Heather Powers of Humblebeads some time back. What I present here are what I learned and what I will do different. I think that just getting your hands dirty (and if you are like me and don't wear gloves and think your fingers are a paintbrush, they will be an easy accomplishment) and playing with this stuff is the first step, and clearly that is all I have done here. Very little thought went into final product looks. This was mainly because I didn't know what to expect. If you are a fan of old stuff with rich patinas, and you like surprises, you will have as big of a blast as I did. These are all polymer clay pendants that used several cookie cutters to make the paw-in-heart design. Like I said, it is a mess :) Click on the images for huge blow up versions to really see the details. Lesson 1 : don't expect much on a flat surface. I didn't really think about / know how the patinas would be more likely to cling in interesting ways to texture. I did try to build up some texture with the metal coatings itself from a tip in the Humblebeads tutorial. What I was left with was the patinas clinging to obvious brush strokes. In some spots the patina solution didn't hit the surface right and ended up and being entirely absent. The patchy look was not good, but the dyes helped cover it a bit. Lesson 2 : The least likely beginnings end up looking the coolest (isn't that the way it always is though?) The iron metal coating is a flat grey and really boring when it is plain. It doesn't really look like iron in the same way that the other metal coatings look like the metal they are supposed to look like. That said, I looooove the way that the iron metal coating reacts with the Tiffany/rust patina. Yummmy! I also added blood red and orange dye to really make the rusted feel come through. Side note: the blood red looks like a vial of blood. For real. It is an exact match, enough that I was weirded out for a second. Lesson 3: Messing up can always be fixed. The first layer of this one was bronze + darkening. With the aforementioned brushstrokes it looked HORRIBLE so I basically started over by adding another solid layer of bronze and starting from scratch. Lesson 4: White dye is your friend. It doesn't look like much when you put it on, but when it dries, you get that chalky look you see in this one. LERVE. This one is a tie for my favorite with the rust. Next time around, I will think more along the lines of placement of the dyes and maybe be more aware of where I am adding the patina. I will also be trying out the silver base-coat as I did not have it available for this round of experiments. So these all will be made into simple necklaces and headed to the craft fair for others dog lovers, like myself. Even though they were practice, I think they came neat enough to offer. I will either keep the rust or the bronze/tiffany one for myself. 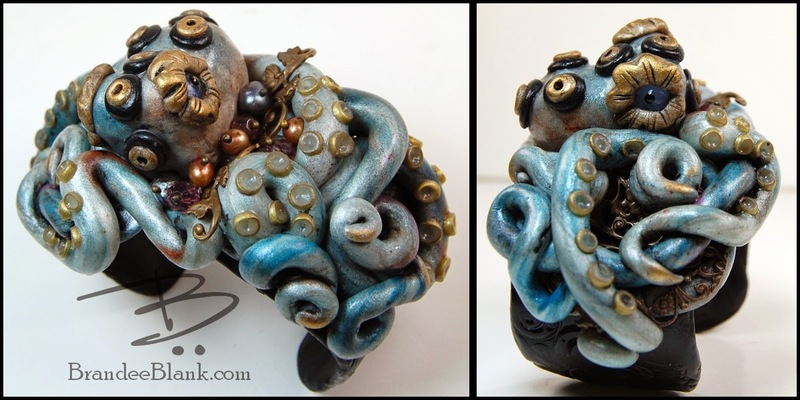 I was contacted by the Seattle Aquarium to donate an octopus piece for their annual fund raiser, Splash. Such a nice compliment! Of course I said I would. And then they came back to me and asked to purchase a second one as a gift for someone. How neat is that! I'm still working on figuring out how to do a fairy figure. I have made huge progress on faces and heads. I tackled DIY eyes that are polymer but look like glass thanks to the tutorials over at Misty Moon Creations. Soon as I get a finished project to show, I'll also post the many missteps it took to get me there. That should be embarrassing fun.